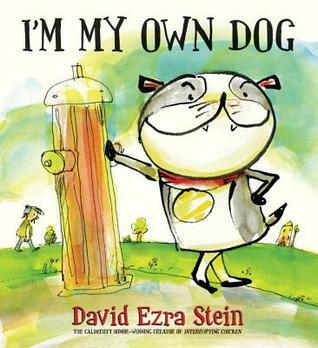 I’m My Own Dog by David Ezra Stein is a nominee for the 2016-17 South Carolina Picture Book Award. In I’m My Own Dog, readers meet a dog who is his own master. He fetches his own slippers, walks himself, tells himself to roll over, and throws sticks for himself. He even gives himself a good scratch from time to time. There’s just one problem. This dog has an itchy spot on his back that he just can’t reach. What’s a poor dog to do? When he simply can’t stand it anymore, the dog lets someone scratch his back for him. After that, the little guy follows him home. Well, the dog can’t just leave the fella out in the rain, so he lets him come inside. Eventually, the dog trains the guy. The dog gets a leash to lead his new friend around, he shows him interesting things like squirrels, and he teaches him how to throw a stick. The dog realizes that his new human may come with some problems–like constant yapping and making messes–but maybe he’s worth keeping anyway. All readers–no matter their ages– will find something to love in this book. It is a wonderful twist on the typical pet story, and it could lead to some interesting discussions on perspective. It is sure to be a hit as a read-aloud with young students, and any dog lover will find something to chuckle over. I also think that I’m My Own Dog may also be a good fit for readers who see themselves as loners. (I’m including myself in that group.) Yes, it’s good to be independent and comfortable with oneself, but having a friend or a helping hand sometimes is just what a person–or dog–needs. If you’d like to use the book trailer I created for this book, see below. Just remember to give credit! 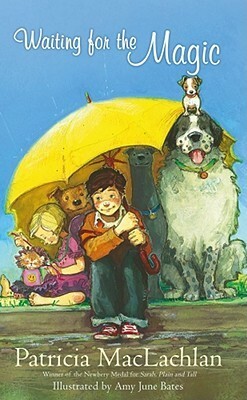 In Mountain Dog, readers are introduced to Tony, a boy who has grown up in a rough environment. His mother is being sent to prison for dog-fighting, and Tony is going to live in the mountains with an uncle he’s never met. Tony doesn’t know what to expect, and he’s plagued by nightmares of yelling, claws, biting…and math. Can life with an unknown uncle be better than what he’s known? Tony dares to hope so. 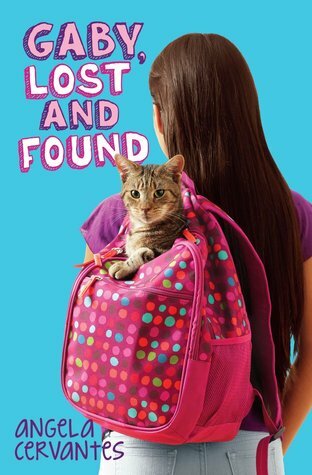 When Tony moves to his uncle’s home in the mountains, he’s met by Gabe, a happy, lovable dog who helps Tony’s uncle on search-and-rescue missions. Gabe, along with Tony’s uncle and a few other people, help Tony to understand life in this wild new environment, how to survive in the wilderness, and everything that happens during SAR missions. Tony gradually begins to thrive–and even feel at home–in the mountains. He’s making friends (both human and canine), he’s writing for the school paper and his own blog, and he’s becoming more comfortable with the numbers that used to worry him so much. He can’t imagine life without his uncle and Gabe…and he doesn’t want to. Tony feels truly loved for the first time in his life, and going back to the way things were with his mom is unbearable. How will Tony handle his uncertain future? Will he find a forever home with his uncle and Gabe, or will he be forced to leave the life he’s come to love? 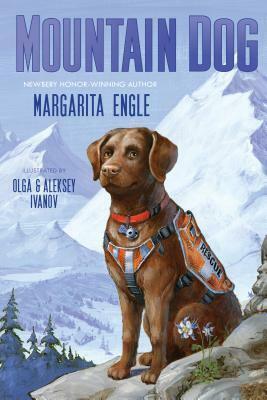 Learn the answers to these questions and many more when you read Mountain Dog by Margarita Engle. Mountain Dog is told in free verse and is a quick read that will appeal to readers in elementary and middle grades (not to mention many older animal lovers). The story is presented in both Tony’s voice and Gabe’s, and it’s interesting to see how both boy and dog view what’s going on around them. Peppered with illustrations by Olga and Aleksey Ivanov, this moving book highlights the bond between man and nature. Mountain Dog shows readers that families come in many forms…and species. Duke by Kirby Larson was the winner of the 2015-2016 South Carolina Children’s Book Award. It’s 1944, and Hobie Hanson is doing what he can for the war effort at home. With his dad fighting in Europe, Hobie is the man of the house, and he tries to help his country in ways both small and large. Hobie’s feeling the pressure, though, to do something bigger than anything he’s ever considered–donate his beloved dog, Duke, to the war effort. The Dogs for Defense program asks Americans to donate their well-trained family pets to the armed forces–as guard and patrol dogs and even bomb sniffers. Hobie knows that Duke is an excellent prospect for this program…but he doesn’t want to let go of his dog. Isn’t it enough that his dad is fighting in this war? Does Hobie have to put his dog in danger as well? Eventually, Hobie gives in and loans Duke to the Marines…and immediately wants to change his mind. In fact, he does everything he can think of to get Duke home. Hobie even betrays a new friend in his quest to be reunited with Duke. None of his efforts work, and Hobie decides to be brave and deal with his situation as best he can…and that decision could have far-reaching consequences. Soon, Hobie will realize that there are many different kinds of bravery. His father, who is in more danger than ever, is brave for leaving his home and fighting for his country. Duke is brave when he follows orders and keeps others safe. But maybe Hobie is brave, too. 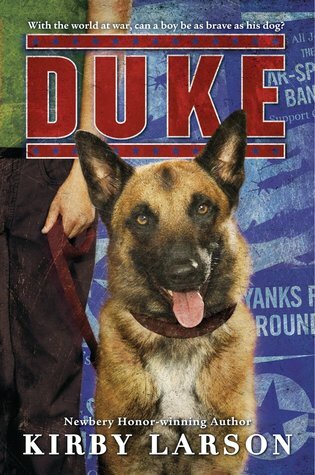 Maybe loaning Duke to the Marines–even though he didn’t want to–was brave. Maybe looking after his mom and little sister is brave. And maybe apologizing to his new friend and standing by his side is brave. Will Hobie’s bravery be enough to hold things together until he’s reunited with those he loves? Will his father come home soon? Will Duke? Discover just how much bravery and love mean to a boy, his dog, his family, and those around him when you read Duke by Kirby Larson!